Sure, you can modernise them all you want, but Thor's classic set of duds are some of comics best. Yellow zebra boots included. Here Kirby literally whips up a storm in the hopes of a prevailing Thunder God - just like I'm betting Hollywood are currently hoping for too! 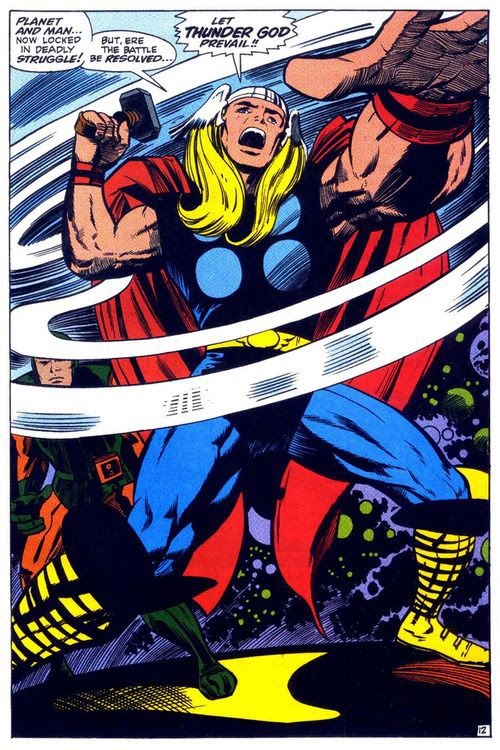 I agree Kirby drew a classic Thor, but for me as time went on his effect was ruined by Vinnie Colletta's interference. So much of the King's work was badly drawn over. Thanks Karl - yes The King did have a bad run of being drawn over. Worst of course at DC. I mean who gets the biggest artist in comics to do his take on Superman, then after the pages are submitted gets an artists to redraw the title character in the panels and make him more Curt Swan like? And then still tries to sell the book to fans as 'Kirby's'. Of all the used car salesmen techniques in comics, that has to rank right up there. Kirby's Thor is my favorite of all time. And yes, that includes Chris Hemsworth. ;) To me, if something in the drawing of Thor by any artist doesn't scream "King" then it just could be any random Norse guy doing cosplay. Thanks Random - see we are Thor twins too! If you tell me Snickers is your favourite chocolate bar I'm going to know there's a greater power at work.